Mulan-inspired cupcakes; black sesame cake, hidden lemon curd centre, and white tea infused frosting. 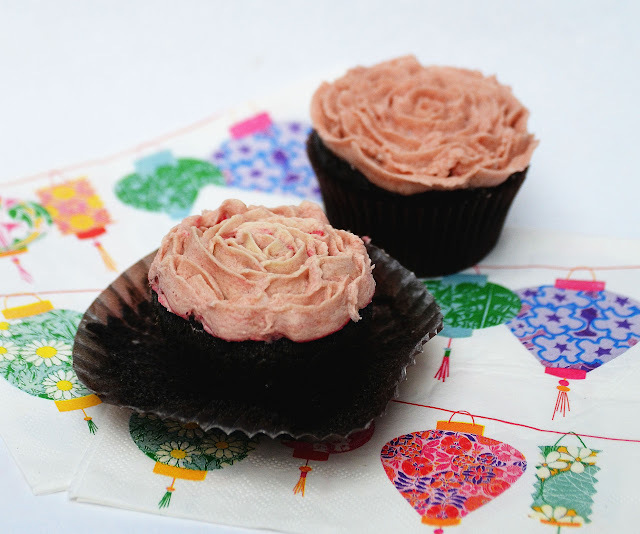 Okay, so I promised a recipe for the Mulan cupcakes from the other day; while I talked a lot about my decisions and the reasons for them in the that post, now you get the practical stuff. 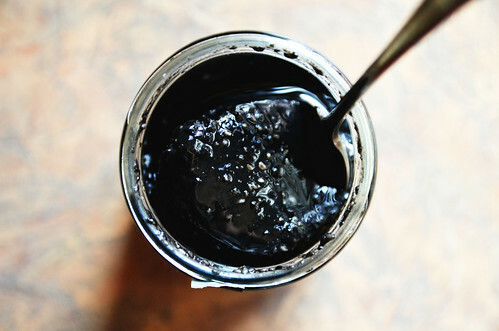 Although Sprinkle Bakes was my flavour inspiration, I knew that I could make a vegan version using black sesame paste, since it’s essentially the same as any other nut butter and nut butters are brilliantly versatile in egg-free baking. 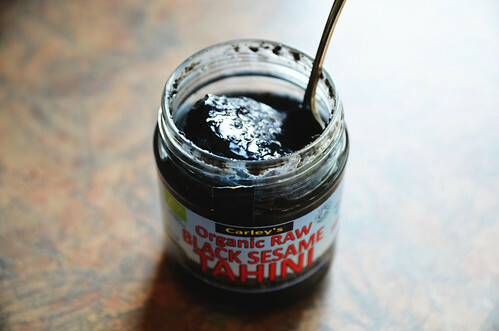 So - don’t go haring after that recipe to grind a more complicated black sesame paste, just use pure black tahini. You can see the type I used above: Carley’s raw organic. Preheat oven to 180C (350F) and line a cupcake tray with liners. Combine the soy milk and apple cider vinegar and just leave to sit for a little while - it’ll thicken up and go lumpy. Tadaa, you made vegan buttermilk! In one bowl, mix the tahini, oil, sugar and vanilla, then slowly add the soy milk mixture. In a second bowl, combine the flour, baking powder, bicarb and salt, then add the wet ingredients to the dry ones and mix in just until blended. At this point you’ll be like, “Wow! I made… grey… goo?? Um??? ?” but trust me, you’re doing okay. Divide as equally as you can between 12 cupcake cases. Bake in preheated oven for 20-25 minutes, until a toothpick comes out clean. For the lemon curd: I used this recipe. If you’re not vegan, you can use a store-bought version. In a saucepan, whisk the sugar and flour together, then whisk in the milk. Over a medium heat, bring to the boil and allow to thicken - this will probably take 10-15 minutes, you don’t have to whisk constantly but just every few minutes. Pour into the bowl of an electric mixer (using the paddle attachment), and just beat the hell out of it til it cools down. 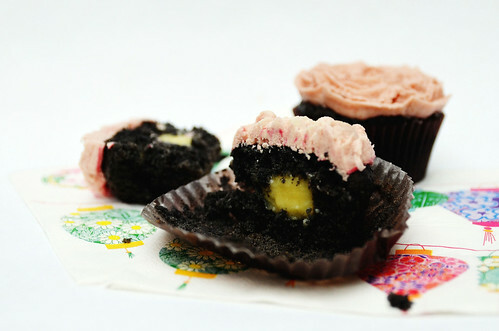 When cupcakes are fully cooled, cut a divot into the top of each cupcake and fill with lemon curd. 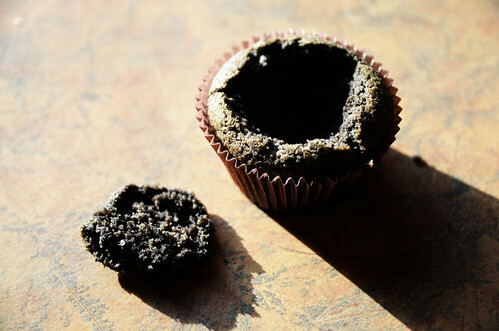 Trim the cut-out cake pieces flat to make a “lid” and place on top of the filled divot. Pipe frosting onto cooled cupcakes - this is a good video if you’re new to flower piping; the tutorial is for roses, but I used a smaller sized petal tip to create some sort of super ambiguous blossom. Uh, flowers are not my calling.